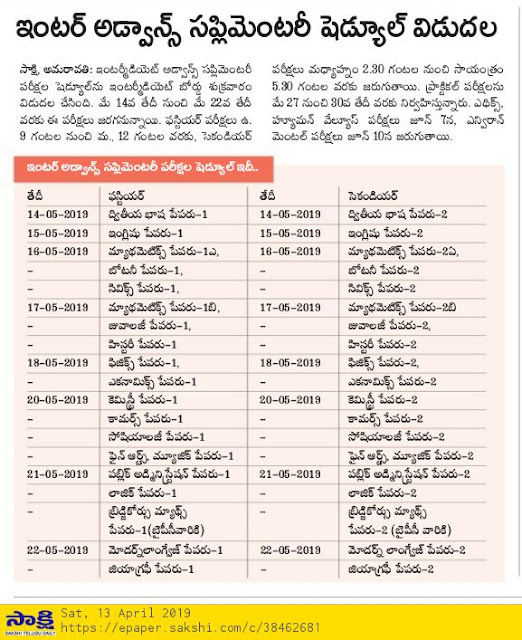 Andhra Pradesh BIE AP Intermediate 1st/2nd Year Advanced Supplementary/Improvement/Betterment Examinations Time Table May 2019 Download. Andhra Pradesh Board of Intermediate Education BIEAP announced Intermediate (10+2) 1st and 2nd year Public Examination results on 12th April 2019. The failed candidates are waiting for the Advanced Supplementary (Betterment / Improvement) Examination from 14th May 2019. The Board has to be announced the Schedule of IPE Advanced Supplementary Exam 2019 on third week of April, 2019. This time table is for M.P.C, Bi.P.C, C.E.C, H.E.C, M.E.C, Vocational students also. Last date of Paying Fee for Supplementary Examinations is 24th April 2019. Time: 9.00 A.M. to 12.00 A.M. Time: 2.30 P.M to 5.30 P.M. If any changes in examination dates please visit BIE AP Official website: www.bieap.gov.in. After second year exam results has come, Is it necessary to write both years exams or else it is optional to write any one or more subject from second year for second year completed students? ?